One of the most common afflictions in modern life is sinusitis, with tens of millions of Americans suffering every year. It appears that the incidence of sinusitis, like that of the related disease asthma, is increasing dramatically at an alarming rate and calls for more attention. Appropriate therapy can greatly reduce the symptoms and frequency of sinus attacks in the great majority of sufferers. 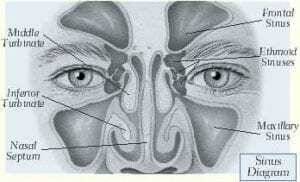 Sinuses are air-filled chambers around the nose. Typically, humans have 4 pairs of sinuses around the eyes that are connected to the nose. The reason why humans have sinuses is not scientifically proven but the hypotheses are that sinuses are there to lighten the weight of our skull or to protect other important structures from trauma as a buffer to mechanical impact. The maxillary sinuses are behind the cheekbones, and are the most well-known sinuses. The ethmoid sinuses are between the eyes and eye-sockets in the middle of the face. The sphenoid sinuses are at the back of the nose, behind the eye sockets, nearly in the center of the head. All sinuses are connected to the nose via small openings called “ostia,” and have skin lining inside called, “mucosa”. The sinus mucosa has thousands of hair-like structures called cilia, which sweeps the mucus produced by the sinuses out into the nasal passages and to the throat where it is swallowed. Typically, humans will produce about a quart and a half of thin watery mucus everyday. This process is usually not noticed unless the mucosa becomes thickened or infected. The constant flow of mucus sweeps the bacteria and dust particles out of the sinus, keeping the sinuses clean and sterile. The openings to the sinuses or “ostia” are very small, and problems occur when the mucosa linings of the openings thicken to the point of blocking the opening. When this occurs, mucus and bacteria are trapped in the sinuses and an infection starts. The infection will lead to more swelling and may turn into a negative cycle that exacerbates over time. Most of the sinuses drain out through the small area behind the middle turbinate. 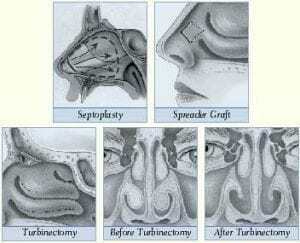 The openings can also become blocked if the middle turbinate is too large or pushed to the side to the opening by a deviated septum. The common causes of sinusitis are cold and allergies. Sinusitis can often start with cold, a viral infection, but later also become a bacterial infection. If you have had cold symptoms for more than a week, you should suspect a bacterial sinus infection because a common cold symptoms caused by virus typically resolve within a week period. Typical allergy symptoms are sneezing, itchy eyes/nose/throat, stuffy nose, and clear nasal discharge. When you develop colored runny nose, headache or coughing of thick mucus, then chances are that your allergy or simple cold has escalated into sinusitis, and you consult a specialist for the treatment. Again, typical symptoms of sinusitis are colored nasal discharge, thick post nasal drip, pressure-like headache, and stuffy nose. But other more advanced symptoms of sinusitis include ear clogging (as if riding an airplane), throat discomfort, coughing, and post-nasal drip. These symptoms indicate that the infection in the nose and sinuses has spread and affecting surrounding structures such as ears and throat. 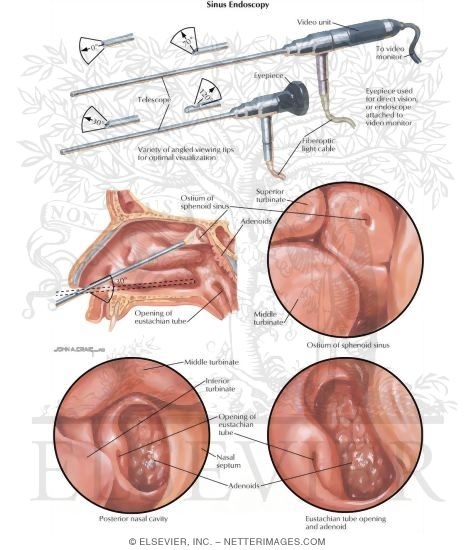 ENT specialists have a tool called endoscope that allows the examination of the deeper portion of the nose without discomfort or pain that aids the definitive diagnosis of sinusitis. 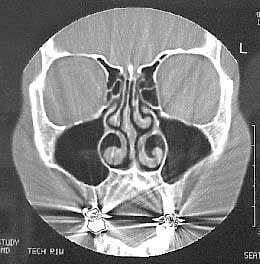 Cat scan of the sinuses done in a radiologist’s office can also help to check the presence of chronic sinusitis. Cat scan of the sinuses are quick and does not involve sometimes claustrophobic experience of MRI. Allergy testing is very useful for treatment planning. Between one-third and one-half of all people will have some degree of allergy, and the proportion is higher in those with chronic sinusitis.